Download a copy of our hospital map to help you easily find your way through the hospital. Handicapped parking is available in all parking areas. Visitors are asked to park in the visitor parking lot, near the front entrance. The hospital is not liable for damage to a vehicle left in the parking lot during a patient's stay. 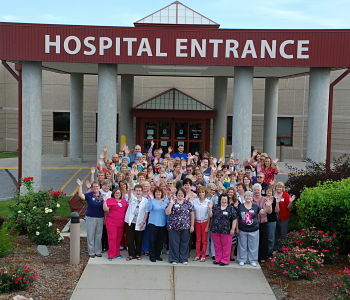 For your safety, the hospital regularly conducts fire and disaster drills to prepare staff in the event of an actual emergency. Please cooperate by following the directions of our staff. If an alarm sounds, remain where you are and staff will direct you. Patients are responsible for their personal belongings while at Montgomery County Memorial Hospital. Please request storage for your personal belongings. Valuables such as jewelry, documents, electronic equipment and large amounts of money should be sent home with a family member. To prevent damage or loss, eyeglasses, hearing aids and dentures should be kept in safety containers when not in use. The use of home electrical appliances are safety issues and are allowed only at the discretion of the maintenance department. To ensure the safety of our patients and visitors, the front entrance is locked from 9:00 p.m. until 7:00 a.m. The Emergency Department entrance is open 24 hours a day. Wholesome, nourishing and well-balanced meals are an important part of your treatment and recovery. At Montgomery County Memorial Hospital, you will receive a menu to select from daily. Simply check the menu items you would like, and leave the menu on your bedside table. You may not receive a menu if your prescribed diet is highly restrictive or if you are fasting for a medical procedure or test. If visitors in your room would like to order from your menu, they are welcome to request a guest tray. Guest trays are prepared and delivered for $4 each. A registered dietitian is available to provide patients and families with nutrition education and support. If you have a particular preference or concern regarding your meal, ask to speak to our dietitian. Please check with your nurse or caregiver before eating or drinking anything brought in from an outside source. Visitors are welcome to eat in the cafeteria. Grab and Go items-snacks, rolls, beverages and cold items-are available from 6:15 a.m. to 6:30 p.m. Lunch is served from 11:30 a.m. to 1:15 p.m.
Supper is served from 5:30 p.m. to 6:30 p.m. Vending machines are available in various locations around the facility. Ask your nurse or caregiver for the location nearest you. Montgomery County Memorial Hospital is a tobacco-free campus. Tobacco products are not allowed anywhere on the campus. If you are interested in information about smoking cessation options, ask your nurse or caregiver. For additional support and resources, you may also contact the American Lung Association at 800-586-4872.